Exclusive Charter Service is pleased to announce the addition of the 116' Azimut, Vivere to it's fleet. 116' Azimut Grande for living life to the fullest. She has 5 Staterooms that comfortably accommodates 10 guests, with spacious open main salon and dining area. Seating for up to 12 guests in three different areas. Main deck, Aft with wet bar is a full walk around to high/low bow sunpads and seating. Top Deck has 2 retractable sunroofs, dining for 12, spa jacuzzi and wet bar additional sun pads. Beach area/swim platform extension and cruising speed of 23 knots. 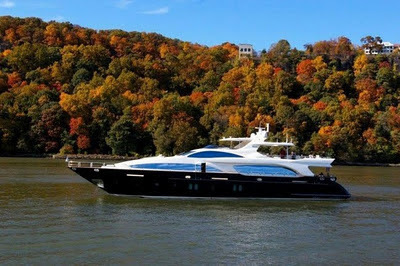 This luxurious motor yacht is available for charter in the Bahamas and Florida. For more information and photos, Click here.